December 27 marks the birthday of Louis Bromfield, renowned Ohio author and conservationist. Louis Bromfield was born near Mansfield, Ohio on December 27, 1896. In his life he was not only a successful novelist, but also an agrarian spokesman who owned Malabar Farm, an experimental farm in Richland County now part of the Ohio park system. His influential writings about the farm and his philosophy of sustainable agriculture were widely read and remain in print along with some of his novels. Long before today’s green movement, Bromfield espoused an agrarian ethos in support of sustainable farming. Bromfield’s family had lived and farmed in the Mansfield region for nearly a century by the time he was born. During his childhood and youth his family struggled financially, and at age sixteen he went to live on his grandfather’s farm. However, his mother wanted Louis and his brother to pursue a different life, and she encouraged their literary and academic interests. Bromfield eventually left to study agriculture at Cornell, returned briefly to work on the family farm, and then left for Columbia University. In 1917, Bromfield enlisted in the U.S. Army’s Ambulance Service and served with several different units of the French army during World War One. He saw action as an ambulance driver in seven battles and was awarded the Croix de Guerre. After the war Bromfield returned to America and worked as a reporter, editor, book and theater reviewer and an advertising manager for G.P. Putnam. He married Mary Appleton Wood on October 16, 1921. Bromfield had been writing in his spare time, and in 1924 he published The Green Bay Tree (1924), the first volume in the “Escape” tetralogy. This novel was followed by Possession (1925), Early Autumn (1926, winner of the 1927 Pulitzer Prize), and A Good Woman (1927). After the publication of his first novel, Bromfield and his wife visited Senlis, France, intending only a visit of two months. 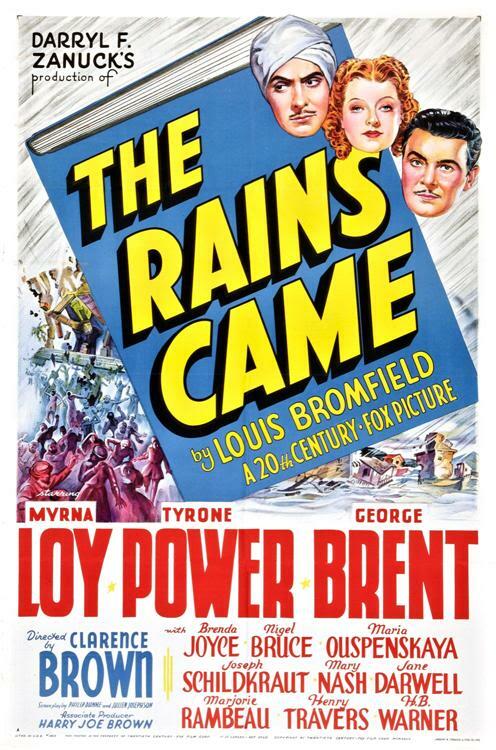 The vacation turned into a stay of thirteen years, during which time Bromfield continued to publish novels and short stories and see some of his works made into films, including a bestseller in 1937-38 entitled The Rains Came, set in India. During this time overseas, Bromfield had come to enjoy the life of a prosperous expatriate artist, but there was a growing dissatisfaction with his life and its round of pleasures. He longed to feel more deeply rooted in the world and connected to the land, and had begun considering a return to Ohio as early as 1933. It was during the years in Senlis that Bromfield wrote The Farm, one of his finest and most personal works of fiction. With the prospect of another European war in sight, Bromfield relocated his family, which by now consisted of three daughters, back to the U.S. He purchased three adjoining farms near Mansfield and named the property Malabar Farm. Bromfield purchased these farms during the winter, and during a thaw he was shocked to see how worn out the land was from poor farming. He set out to restore the earth and root himself and his family on the property. Bromfield also wanted an expansive house to live in, and he worked with an architect to build onto an existing farmhouse on the property, incorporating a number of architectural motifs found in Ohio. Malabar Farm soon became known as a relentless hive of activity. Bromfield himself was busy with his managers and farm workers when not writing the novels and screenplays financing the farm, and there was a steady stream of visitors, ranging from other farmers and the merely curious to Hollywood celebrities. 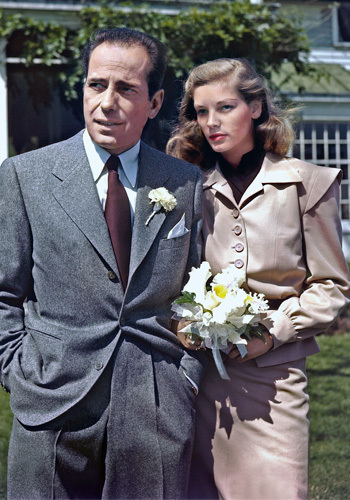 These celebrities included Humphrey Bogart and Lauren Bacall, who were married at Malabar Farm on May 21, 1945. From the mid 1940s on, Bromfield’s writing became more focused on agriculture and ecology (although he continued to write novels), and he also wrote a syndicated newspaper column and hosted a Saturday morning radio show. Sunday afternoons were given over to leading large groups on tours of the farm—sometimes of 100 or more people–and expounding his agrarian philosophy. Bromfield and his workers were successful in restoring the soil, and the farm eventually developed into a livestock and dairy farm where livestock were grass-fed—exactly the kind of healthy, sustainable operation a lot of people today are choosing to support. 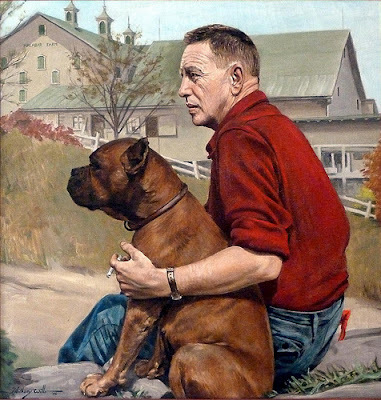 In 1945 Bromfield published the first of his agrarian works that are an essential part of his legacy: Pleasant Valley, a work detailing Bromfield’s return to Ohio and reasons for establishing the farm. This was followed by a collection of essays and journal excerpts entitled Malabar Farm in 1948. These were followed in turn by Out of the Earth (1950), From My Experience (1955) and Animals and Other People in the same year. Bromfield’s ideas were influential, leading to the establishment of a Texan version of Malabar Farm and also Malabar-do-Brasil, an experimental farm in Brazil owned by a group of Brazilian businessmen. For a while Bromfield’s daughter Ellen Bromfield Geld and her husband managed Malabar-do-Brasil until purchasing their own farm in that country. Ellen Bromfield Geld and her husband still run that farm, and she is also a novelist, newspaper columnist and memoirist who wrote a memoir entitled The Heritage: A Daughter’s Memories of Louis Bromfield (1962). By 1951, Bromfield had published his last novel and had only five years left to live. His longtime friend and business manager George Hawkins had died in the late 1940s, and Bromfield’s wife Mary died in 1951. 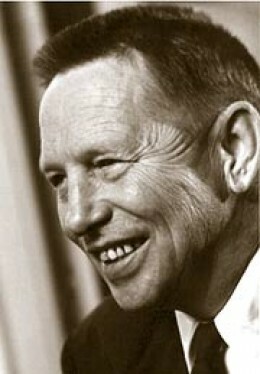 His daughters Hope and Ellen married in 1950. During the early fifties, Bromfield also became embroiled in litigation regarding the Malabar Texas experiment, and running Malabar Farm had become increasingly costly. He was diagnosed with bone cancer in 1955 and had to sell his watershed timber rights to pay his hospital bill. After his death, a family friend named Doris Duke purchased those rights and donated them back to the family. His daughters sold the farm two years after his death. It eventually passed into state ownership in 1976 after previous possession by two different foundations. Now visitors can tour the farm and “Big House” and learn about Louis Bromfield and life at the farm, and the park also serves as a research center for sustainable farming. There is still a working farm on the property, but on a much smaller scale than Bromfield’s time. Most critics seem to regard Bromfield’s earliest novels as his best. By the early 1930s Bromfield was under critical attack, some suspecting he was writing with an eye towards Hollywood. He also drew another kind of criticism. Although a Democrat and supporter of the New Deal in its earlier forms, Bromfield became critical of New Deal policies later on, seeing in them support for the kind of industrial society and government centralization he opposed as a supporter of Jeffersonian democracy. He was not alone in his position. Similar concerns came from some members of the Southern Agrarians and Robert Frost, but in the political climate of the 1930s such views were not popular with critics, reviewers and others in writing and publishing who leaned to the left, whether in support of FDR or towards more radical positions. Bromfield’s nonfiction works didn’t focus solely on agricultural and environmental issues. In 1939 he published a book entitled England, A Dying Oligarchy, which attacked the appeasement policies of Neville Chamberlain and his administration. He later published works concerned with economics, international relations, and social planning and organization. These include A Few Brass Tacks (1946), and A New Pattern For A Tired World (1954). Like many writers, Bromfield was preoccupied with the pressing question of how one should live in the world, and was concerned in particular with living in harmony with the land, with nature, and with other human beings. Although it might be tempting to see Bromfield as having two literary careers—one as fiction writer and the other as agrarian commentator—both strands of writing serve a vision. Particularly in his earlier novels, such as the “Escape” tetralogy, Bromfield writes of people who are thwarted in some way, whether by oppressive social or family relationships or pressures, and lack the kind of social support or structure that allows the release of creative energy. This search for rootedness and fulfillment by his characters is sometimes contrasted with a vigorous bygone world that was overrun by modern industrialized society. Bromfield himself sought a rich and meaningful life connected to the land and creation, similar to that of his ancestors in Ohio and the yeoman farmers Jefferson believed were the stewards of democracy. He might have run into the realities of the modern world, but we are the richer for his writings and example. The state of American agriculture is as important an issue of our times as it was for his. Bromfield’s papers are held at both Malabar Farm in Lucas, Ohio and in the Munroe Archives of the Ohio Historical Society. Louis Bromfield died on March 18, 1956 at University Hospital in Columbus, Ohio. (This entry has been modified slightly. It was originally posted on Buckeyemuse on January 27, 2014). Louis Bromfield by David D. Anderson. Twayne Publishers, Inc. New York, 1963. Ohio Authors and Their Books 1796-1950 edited by William Coyle. The World Publishing Company, Cleveland and New York, 1962. “Louis Bromfield: Ohio and Self-Discovery by James M. Hughes. The State Library of Ohio, Columbus, 1979 (one of a series of monographs on Ohio writers). January 1, 1864: Albion Tourgee is discharged from the Union Army. Albion Tourgee in the Civil War. his family in the Reconstruction south. Tourgee will be the subject of future posts, but on this occasion I would just like to take note of his military career, as Tourgee was one of only a handful of American authors of note who served in the war. Tourgee, who was born in Williamsfield, Ohio in Ashland County, first joined a company of dragoons formed by a mathematics professor at the University of Rochester in New York. He was later transferred to the 27th New York Volunteers. Tourgee was at the First Battle of Bull Run and was struck in the back by a gun carriage wheel, causing a serious back injury that kept him bedridden for months and plagued him the rest of his life. Granted an honorable discharge, he returned home to Ohio to study law. Tourgee strengthened as the months passed, and he wanted to return to the service. By July of 1862 Tourgee had recovered sufficiently to join Company G of the 105th Ohio Volunteers and received a first lieutenant’s commission. 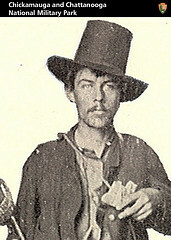 Tourgee and his unit were in Kentucky from July through October of 1862, and he fought in the Battle of Perryville, Kentucky on October 8, 1862. Tourgee was once again injured, this time by a bullet wound to his hip, and he spent the rest of October and November in a hospital in Danville, Kentucky. He then rejoined his company, which was busy chasing Confederate General John Hunt Morgan, and Tourgee was captured by Morgan and his men near Murfreesboro, Tennessee in January of 1863. 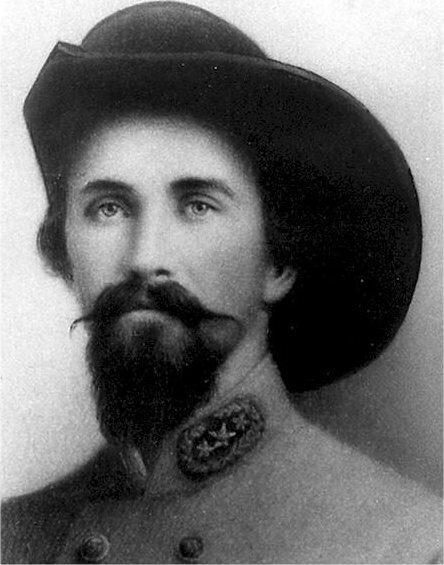 Confederate General John Hunt Morgan. He spent the next few months in a series of Confederate prisons, including the infamous Libby Prison in Virginia. Despite the harshness of prison life, Tourgee was still able to feed his mind, reading Cervantes and Thomas Carlyle. After several months confinement he was released and returned north. (It was not uncommon in the early years of the war to have paroles and prisoner exchanges. This changed as the war went on, in part contributing to the overcrowding and misery at places such as Andersonville). Not long after his return to Ohio, Tourgee married Emma Doiska Kilbourne on May 14, 1863 in Columbus. But by late May Tourgee was headed back to the front, noting in his journal on May 25 that “To-day I left for the war again.” He rejoined his company as they readied for the Chattanooga campaign. Tourgee saw his last action of the war at the Battle of Chickamauga in September of 1863. Recurrent back problems led to his being discharged from the service. Tourgee later tried to rejoin once again, hoping to obtain an officer’s commission in a black regiment, but the war ended. Tourgee would go on to become an editor, a lawyer, a judge, U.S. counsel to Bourdeaux, France, and the author of 23 books. One of those would be a history of old comrades: The Story of a Thousand, Being a History of the Service of the 105th Ohio Volunteer Infantry, in the War for the Union from August 21, 1862 to June 6, 1865. Albion Tourgee died in Bourdeaux, France on May 21, 1905 at the age of 67. His ashes were interred at the Mayville Cemetery in Mayville, New York.